One of the concepts a lot of software development teams struggle with is evolutionary design. It's the foundation of Agile Software Development, but also something many teams attempting to be more agile get wrong. Evolution is an iterative problem solving algorithm. Each iteration creates a product that users can test and give feedback on. This feedback drives changes to improve the design in the next iteration. It may require additional features. It may require refinements to existing features. To illustrate, consider the evolution of the guitar. The simplest design for a guitar could be a suitably straight stick of wood with a piece of string fastened taught at both ends, with some kind of container - like a tin can - to amplify the sound it makes when we pluck the string. That might be our first iteration of a guitar. Wouldn't take long to knock up, and we could probably get a tune out of it. Anyone who's tried playing that kind of design will probably have struggled with fretting the correct notes, so maybe in the next iteration we add dots to the stick to indicate where key notes should be fretted. Perhaps in the next iteration we take strips of metal and embed them in our stick to make fretting even easier and more accurate. In the next iteration, we might replace the stick with a plank and add more strings, tuned at different musical intervals so we can play chords. We might find that, with extensive use, the strings lose their taughtness and our guitar goes out of tune, so we add a way to adjust the tension with "tuners" at the far end of the plank. Also, occasionally, strings break and we need to be able to replace them easily , so we make it so that replacement strings can be fastened to a "bridge" near the can. Up close, our guitar sounds okay. But in a larger venue, it's very difficult to hear the sound amplified by the tin can. So we replace that with a larger resonating chamber: a cigar box, perhaps. Travelling extensively with our cigar-box guitar, we realise that it's not a very robust design. So maybe we can recreate the basic design concepts in a better-crafted wooden neck and body, with properly engineered hardware for the bridge and the tuners. And perhaps it's time to move from using strings to something that will last longer and stay in tune better, like thin metal wires. News of our guitar has spread, and we find ourselves playing much larger venues where - even with the larger resonating chamber - it's hard to be heard over the rest of the band. For a while we use a well-placed microphone to amplify the sound, but we find that restricts our movement and prevents us from doing all the cool rock poses we've been inventing. So we create "pickups" that generate an electrical signal when the metal strings move within their magnetic field at the frequency of the fretted note. That signal is then sent to an amplifier that can go as loud as we need. What we find, though, is that the resonance of our guitar generates a lot of electronic feedback. We realise that we don't actually need a resonating chamber any more, since the means by which we're now generating musical tone is no longer acoustic. We could use a solid body instead. The pickups are still a bit noisy, though. And the strings still go out of tune over an hour or more of playing. So we develop noiseless pickups, and invent a bridge that detects the tuning and autocorrects the tension in the strings continuously, so the guitar's always in tune. Then we add some cool LED lights, because rock and roll. 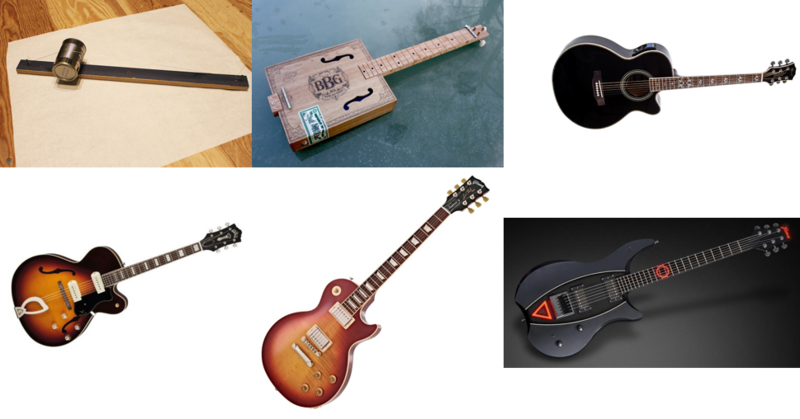 The evolution of the guitar neatly illustrates the concept of iterative design. We start with the simplest solution possible, play it, and see how it can be improved in the next iteration of the design. Each iteration may add a feature (e.g., add more strings), or refine an existing feature (e.g., make the neck wider) to solve a problem that the previous iteration raised. Very importantly, though, every iteration is a working solution to the headline problem. Every iteration of the guitar was a working guitar. You could get a tune out of it. The mistake many teams make is, instead of starting with the simplest solution possible and then iteratively improving on it to solve problems, they start with a concept for a complex and complete solution and incrementally work their way through its long feature list. Instead of starting with a stick, a string and a tin can, they set out to build (as illustrated above) a Framus Stormbender high-end custom guitar with all the bells and whistles like locking tuners, an Evertune bridge, noiseless Fishman Fluence pickups and a fretboard that lights up (because rock and roll). This is not iterative, evolutionary design. It's incremental construction of a completed design. The question then is: do we really need the locking tuners? Do we really need the Evertune bridge? Do we really need the Fishman Fluence pickups? Because the Stormbender is a very high-spec guitar, and that makes it very expensive compared to, say, a perfectly usable standard Fender Stratocaster. The emphasis in evolutionary design must be on solving problems. We're iterating towards the right solution, improving with each pass until the design is good enough for our needs. Each iteration is therefore defined by a goal (ideally one per iteration), not by a list of features. Make it so you can play a tune. Make it so it's easy to fret the rght notes. Make it so you can adjust the tuning. Make it so you can play chords. Make it so you can hear it in a large room. Make it so it doesn't fall to pieces in transit. Make it so it can be heard above the drums. Make it so there's less feedback. Make it so it's always in tune. And so on and so on. Of course, when Framus construct a Stormbender, they don't start with a stick and a piece of string. They incrementally construct it, because they already know what the finished design is. And when they designed the Stormbender, they didn't start with a stick and a piece of string, either. They started with the benefit of hundreds of years of guitar design progress and many problems pre-solved. Likewise, I don't start every software product with "First, I'm going to need an AND gate" and work my way up from there. Many of the problems have already been solved. When Google set out to create their own operating system, they didn't start by creating a simple BASIC interpreter. Many of the problems had already been solved. T hey started where others left off and solved new problems for the mobile age. My point is that the process of solving those problems was evolutionary. Computing didn't start with Windows 10. It started with basic logical operations on 1s and 0s. Likewise, when we're faced with problems for which there are no pre-made solutions, we start with the simplest solution we can think of and iteratively improve on that until it's good enough for our needs.